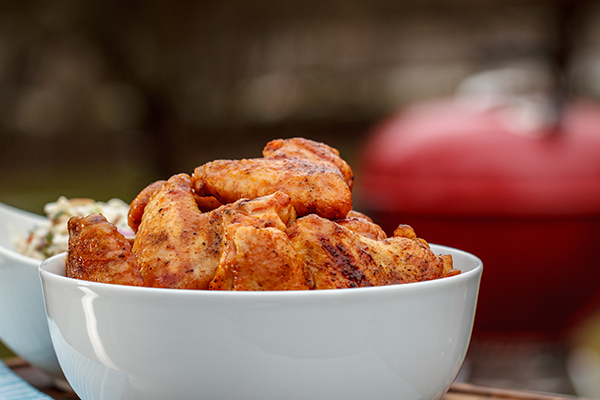 There are as many ways to grill chicken wings as there are ways to season them. Smoked, grilled, planked, wet, dry, sweet, spicy, bbq, plain...and I’m just getting started. Like most things, less is more, and when it comes to my favorite wings, I look no further than Buffalo. Hot sauce, butter, and some added sweet, sour, and garlic notes make the perfect combination of flavor for straightforward grilled wings. While breaking a wing down makes for easier eating, I just as much love grilling them whole and pulling it apart as I go. Besides, it makes managing the wings on the grate twice as easy. I am an ardent fan of sides, and when it comes to the perfect accompaniment, I’m looking for flavor that isn’t filling. Enter the slaw. Sliced cabbage with the added texture of diced apples and the fantastic pungent kick of blue cheese gives me a serious decision as to what I want to next, another wing, or another spoonful of this creamy blue cheese and apple slaw. Thanks to the magic of Jamie Purviance, your next grilled chicken wing dinner already has a waiting list, me! 1) In a large bowl combine the cabbages and apple. In a small bowl whisk the mayonnaise, ¼ cup of the blue cheese, the mustard, vinegar, celery salt, salt, and pepper (some cheese lumps may still be apparent). Spoon over the cabbage mixture and toss to coat. Add the remaining 2 tablespoons blue cheese and parsley and toss again. Chill for at least 1 hour or up to 4 hours to allow the flavors to develop. 2) Prepare the grill for direct and indirect cooking over high heat (450° to 550°F). 3) Season the chicken wings evenly with the salt, pepper, and cayenne. 4) Brush the cooking grates clean. Grill the wings over indirect high heat, with the lid closed, until the meat is no longer pink at the bone, 20 to 25 minutes, turning once or twice. 5) Meanwhile, prepare the sauce. In a small saucepan combine the sauce ingredients. Cook over medium heat until the butter melts, stirring frequently. Transfer half of the sauce to a large, shallow bowl and reserve for tossing with the wings before serving. Pour the remaining sauce into a small bowl for brushing on the wings during grilling. 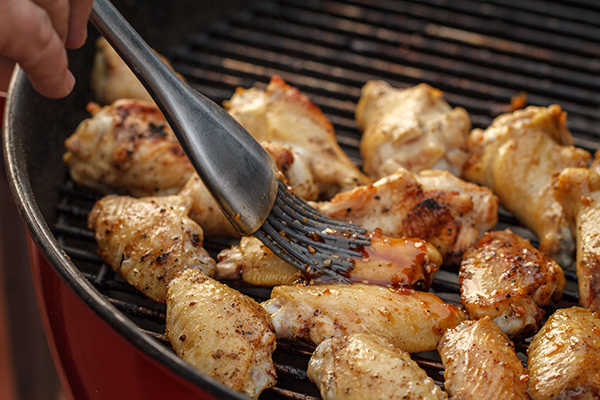 6) Move the wings over direct high heat and leave the grill lid open. 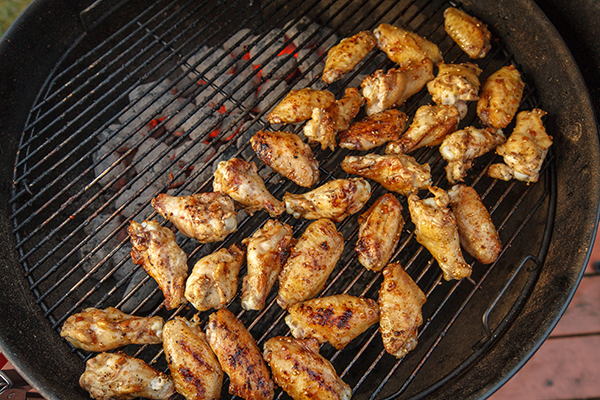 Brush the wings with the sauce from the small bowl and grill until evenly charred, 5 to 7 minutes, turning a few times. Discard any of the sauce used to brush on the wings. Transfer the wings to the large shallow bowl with the reserved sauce and toss to coat. 7) Stir the slaw well and serve with the wings.